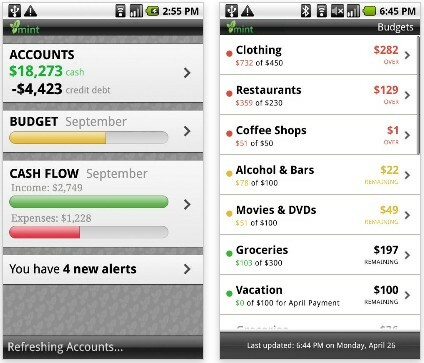 Last October I highlighted five of the best Personal Finance Applications for Android phones. Since then, that article has been one of my most popular to date. 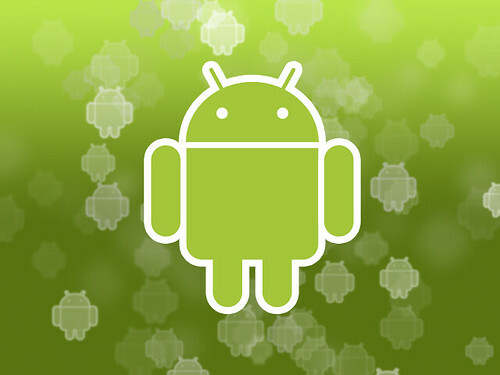 On the mobile front, Android has climbed the ranks and actually surpassed the iPhone in unit market share. The Android app market now contains nearly a whopping 100,000 apps compared to the meager 10,000 that were there when I got my first Android phone less than a year ago. In light of that huge increase in apps, I thought it would be appropriate to review another handful of great Personal Finance Android apps! This would have topped my list last year, if the app was around. It was available on the iPhone but only this past May did it make it to the Android phone. Nevertheless, it is a fantastic tool to have. The app can do almost everything you can do from the web interface in your Mint.com account. If you are unfamiliar with Mint..ya gotta be kidding me! Seriously, you should sign up for a free account because it is one of the most versatile and powerful personal finance tools you will find on the web. Their app is no different, the start page shows an at-a-glance summary of your total cash, and debt; your total budget and your standing within; any alerts you may have; and you monthly cash flow. This summary screen is very informative, but each of these sections is a button and clicking them will give you detailed information about each. You can read your alerts, view details about cash flow and where you are spending by category or vendor, view your individual budgets in detail and view all your accounts in detail. You can even go into each account, see transactions and change categories if mint happened to put something in the wrong place. I waited and petitioned for this app since I got my phone, and Mint.com didn’t disappoint! This app was actually orchestrated by a personal finance blogger! [email protected]MoneyCrush didn’t design it herself but is the brains behind the app. The app is based on the snowball debt payoff system and does a great job at organizing, tracking and reporting your snowball progress. You enter your debt totals, balances and interest rates and it gives you a summary of how much you have left, and when you are estimated to be debt free. Below that, it sorts your debts in ways of your choice, lists all the info about your debts and shows a bar graph displaying your paid off percentage. It even has an alert feature to remind you when your bills are due. The app is really great visually and I could see it helping many people get out of debt. It’s available for the iPhone as well. This one is a bit funner than others you may use in the personal finance category. It’s a game that puts you in a vertual stock market, gives you a set amount of money and lets you go hog wild. You compete against other players to reach the highest net worth and it ranks you along the way. The virtual market within the game is actually based on the real stock market, and everything is real time so if you are buying virtual stocks of Apple or Google, they will be at the same price as those companies’ real stocks. I’ve seen the benefit of learning in a virtual world and I think this is not only a really fun app to learn the basics of stock trading, but really educational too. This one is sort of a catch all and can do just about anything you could want from a personal finance app, it’s just not as specialized as other apps available such as Mint.com or the Pay Off Debt App. This app has an expense manager where you can hand enter your expenses and it will keep a running tally of them. It has a deal search engine where you can find the latest deals though I’m not sure what critiria it searches on as it just spews out random “deals” from a bunch of different sources. It has a bank rate list that gives loan, mortgage, savings, credit card and even auto rates. It has a currency convertor. It has a tip, loan, interest rate and retirement calculators. It even has a section to track your stock portfolio, which can be imported from an external source such as Google Finance, or can be manually entered by stock symbol. Along with personal portfolio tracking, it has a section to track the entire market standings and market news. Although I would never use it’s expense tracking features, and I already use Google’s Finance app for Android to track my personal portfolio, I am very impressed with not only the quantity of features this app has, but the overall quality as well. It’s a great Swiss army knife of personal finance tools. Last in the list this go around is Money Tips. This app is another “fun” one but it’s actually really useful. It’s very simple to use. You open the app, and there on the screen is a tip to save money! It has a ton of tips within and I have yet to have one repeated. It gives you the ability to text the tips you see out to other phones, or email them to yourself or friends. These apps are all available by searching the Android app market for their title. With nearly 100,000 apps in the market, I have yet to use every personal finance app in the market so this will not be my last review of Personal Finance Apps for Android! There is a whole world outside the US and while we would like to use mint we can’t. Nowhere in your article do you mention it only works in the US. Imagine the flames I would get if I listed 5 fabulous apps for Personal Finance and they only worked in Spain. It might be an awesome app but its not awesomely available – please make that clear. Serge Nicaudie on Is Auto Assure a Scam? Serge Nicaudie on Amazon Prime Review – Is It For You?